The best way to predict what the future holds, they say, is to look to the past, but such a philosophy isn't necessarily the best option when it comes to computers. It's a useful way of extrapolating the numbers to see how fast the processors of the future may be; that's one reason Moore's Law continues to work. We can even use it to predict how much RAM future machines will have access to and how big hard drives are going to get, but given that the biggest changes to computers come in the way we use them, any predictions of the future would be better left to futurologists, industry wishlists and brief glimpses of roadmaps. You need only look at the rapidly changing way in which we use our computers to see that it's not just technological advances that have pushed the PC to centre stage in our lives. 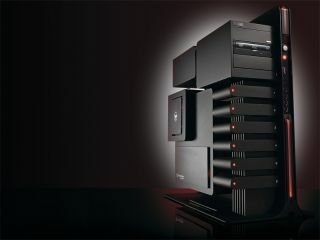 The PC has left its expensive, exclusive, elitist origins. Instead of being reserved for education and the workplace, as was once the case, PCs can now be found in nearly all our homes. We've built our whole lives around the things these machines enable us to do. We use them for everything from storing home movies, music and photos, through to planning trips and holidays, socialising, online shopping, gaming, finding a cure for cancer and searching for extraterrestrial life. The PC has come a very long way in 25 years. So what does the future hold? How do we get there? Here are the ten advances that we believe will govern the shape of the PC in 25 years' time. The move to cloud computing has already begun. The idea of everything being held and worked on centrally will have become entirely natural by 2036. That said, there are some obvious aspects that will need to be raised before this can happen, like security and the underlying infrastructure. But these will be addressed, and soon. You only need to look at the likes of Microsoft Office 365 and Google Documents to see that this is a revolution in full swing, and one that benefits anyone who needs to access the same data and files from a variety of sites and machines. Everything from office work to games is a potential distributed target, as long as the infrastructure is perfect. And when that happens, there's nothing to stop us having entire operating systems in the cloud - virtualisation taken to the next level, if you will. The immediate knock-on effect of such a connected society is that the power needn't be at the local level as it is now, but rather at the server level. This regression to client-server architecture has already begun. In a world where everything is stored in the cloud, localised storage will still have a use, but it will mainly be used as a backup for your own content, or as a cache for your most accessed files. We can also see this linking to a legitimate filesharing system, which will help offload demand on the more popular servers. Content that we currently consume, like movies and music, won't ship on physical media. Instead, subscription services will offer access to the latest releases as well as an ever-growing back catalogue. The obvious upside of this is what you'll be able to watch what you want wherever you are, and in whatever form is best for the device you're playing it back on. Premium services catering to more esoteric tastes and higher bitrate versions would be obvious differentiators here, although storage and bandwidth won't be an issue by 2036, so ultra high definition television (UHDTV) will be the norm, defining the standard resolution of 7,680 x 4,320 at the very least. Netflix, one of the biggest video-on demand services in the world, has already predicted that DVD rental sales will peak as early as 2013, when it expects its instant streaming service to take over. The brave new world of cloud computing means a fundamental change in the way we view security. Big business has already voiced serious concerns about the ability to ensure mission-critical information is kept private, while the idea that anyone could potentially hack into everything you own could well slow the adoption of cloud computing before it hits its stride. While not directly related, recent hacking attempts by Anonymous and LulzSec highlight how unprofessional some businesses are when it comes to security, and how poor they are at maintaining server updates. In order to live our computing lives in the cloud, we'll need to be able to log into such services smoothly and securely. An overall standard to do this would make this process easier for the end user, but at this stage developers are still fighting against each other, and it's currently impossible to see how we advance from our current swathe of sometimes insecure methods to something that's more much workable and universal. The old-guard security firms are now setting up in the cloud as well, offering services that scan transactions directly in the cloud. Better security needs to happen, even if the future is hazy. The word 'computer' refers to a lot more than just a stationary system tethered to power socket. You only need to look at the model changes in the likes of Apple to see where the future of computing lies: super thin laptops in the main, with smartphones also doing more and more work and desktops increasingly reserved for specific power-hungry applications like gaming and heavyweight professional tools. Basic consumer PCs will be limited to compact all-in-one systems built into the back of the screen - a trend that's already being pushed in highstreet computer shops. In 25 years' time, your whole PC may even be pocketable - a tiny USB stick-sized device that you can plug directly into your monitor, your smartphone, or any number of public screens. The migration of more and more features traditionally associated with the motherboard chipset onto the processor itself is already starting to pay dividends the efficiency front, and we should ultimately see everything shifting into the CPU - including RAM, storage and networking interfaces. Upgrading an existing machine will be rendered pointless, but with dropping costs, the era of the truly disposable computer will one day be upon us. The power requirements of all portable computers will continue to drop, with the less-than-1W device capable of granular levels of self power management that mean only the silicon needed for a specific task is on. This is an obvious extension of what mobile phones and mobile processors can already do, but pushed to an even greater degree where the device's default state is to be completely asleep. The aforementioned computer on a chip designs mean that this will be necessary to stop subsystems drawing power when it isn't needed. Improvements in battery technology, with different materials, should see the fabled 24-hour computing becoming not a one-off rarity, but the norm. Battery designs that are capable of offering different voltages and loads to different areas of the chip can improve efficiency, while price drops and efficiency rises in solar technologies should mean that we can recharge such devices while we're using them. A standardised charging system that enables tomorrow's devices to be charged using a power efficient induction system means that pads next to our workstations, in our homes and in our (flying) cars will top up the battery charge without requiring the numerous cables that currently plague our battery lives.